Opens 2nd weekend in May thru mid-October. The purpose of the Babbie Rural & Farm Learning Museum, located at 250 River Road, Peru NY 12972 in Clinton County is to enhance knowledge of rural agriculture life in Northern New York. It is our goal to create an atmosphere that depicts how rural farm families lived and worked in the late 19th and early 20th centuries. The museum will also acquire, restore, display and demonstrate how things were operated during that era. Visitors to the museum learn about New York's rural and farm life development from seeing horse drawn implements, gas engines, early tractors and other supporting tools in action. There are demonstrations for visitors of all ages, many of which are interactive. 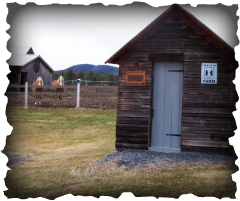 At Babbie Rural & Farm Learning Museum we feel it is important to educate and entertain the public about the rural and agricultural history of the North Country. The museum is a non-profit educational institution dedicated to preserving our historical and agricultural way of life. The Babbie Rural & Farm Learning Museum was established in the spring of 2010. It was founded by Leeward Babbie and established as a non-profit organization. It has always been Leeward Babbie's dream to start a museum that demonstrated rural farm life and to display the heritage and history of the Champlain Valley and the Adirondack Mountains and teach this history to the public.